When it comes to modern dentistry, you have a lot of options to choose from in order to restore or improve your smile. From dental bridges to veneers to implants and more, no smile is “beyond help” and an aesthetically pleasing smile is possible with a little time, effort, and a skilled dentist. In today’s blog, we are going to go in-depth about three services we offer at Shores Family Dentistry in Fort Collins that can replace teeth and restore your smile. 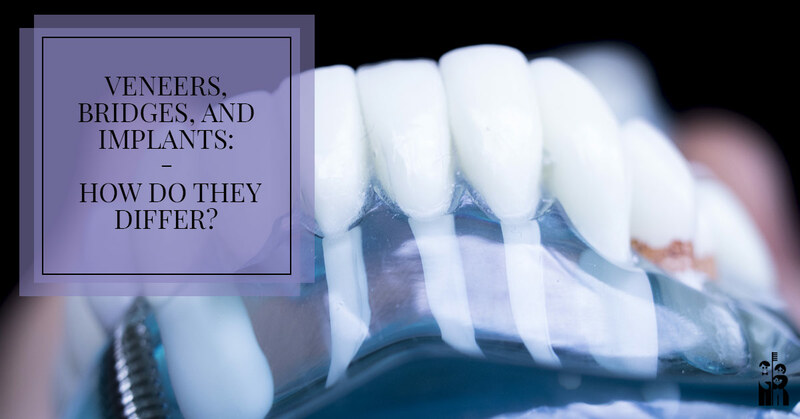 Keep reading to learn more about dental bridges, implants, and veneers. Dental bridges are exactly what they sound like: a bridge that fills a gap caused by missing teeth. By anchoring a bridge to healthy existing teeth, you can regain the look of having a full set of chompers without implants. Bridges are most often prescribed for damaged, decayed, or broken teeth and must be anchored to the surrounding teeth. Dental bridges look very natural and only take two visits to complete. Bridges are best for those with good oral hygiene, as bacteria can build up and infections can occur if the mouth is not taken care of. When proper care is taken with your dental bridge and regular dental appointments are made, your bridge can last ten or more years before needing to be replaced or restored. There are three main types of dental bridges that we offer at our Fort Collins family dentist. The first is a cantilever bridge. These are designed to fit areas where there are only teeth on one side of the gap, such as if you are missing molars in the back of your mouth. In this case, the false tooth or teeth will need to be anchored to one or possibly more teeth on one side of the gap in order to stay secure and allow for full function. The next type of dental bridge is a resin-bonded bridge, which is most often used to replace front teeth. The bridge is fused to metal bands that are then bonded to the neighboring teeth. This hides the resin and allows for a beautiful, natural-looking smile as well as reduces the amount of preparatory work needed for the anchor teeth. Lastly, we offer the traditional fixed bridge. This type of bridge can be used anywhere in the mouth where there are healthy teeth flanking both sides of a gap. The bridge is affixed to the teeth on either side of the gap to keep it in place. This bridge cannot be removed once it is put in place, so it is vital to take very good care of this type of bridge. Looking For Quality Dental Care To Restore Your Smile? Click Here! Dental implants are permanent replacements for one or more teeth. While bridges are anchored to existing teeth, implants are anchored by embedding the implant into your jawbone. In this case, the implant functions as the root of the tooth, giving the patient full use of the replacement tooth. Because the jawbone fuses with the implant, the facial structure is maintained because without a “root,” artificial or otherwise, the jawbone can eventually weaken and shrink overtime in that area. While this might sound invasive, dental implants have an incredibly high success rate and most people with good overall oral health are eligible for them. There are two types of dental implants offered at Shores Family Dentistry in Fort Collins. The first is endosteal, which is the most common type of implant. Like we mentioned above, this implant is embedded into the bone of the jaw. The bone will then heal around the implant, making it incredibly sturdy. The second kind of dental implant is subperiosteal. These implants are for people whose jawbones are not dense enough to hold a traditional implant, and instead, the implant is anchored to the surface of the jaw bone with a metal framework. This is good news for people who have previously been told they do not have the adequate bone structure for implants, and we suggest they make an appointment at our dental office to learn more about this potential option. While dental implants may seem like a big endeavor, they can last a lifetime when properly taken care of. Keep in mind, though, that dental implants are not completed in one sitting. First, your jaw will be prepared for the implants, which may or may not involve bone grafting. Then, a metal post will be placed in your jaw, after which you will need to undergo a several month healing process (there are options to ensure you won’t walk around toothless, though your ability to use temporary teeth may be limited). At this point, the implants will be under your healed gums. Then, your dentist will make a small incision and place an abutment, which is another metal piece that extends outside of your gums. Once the gum tissue heals, your dentist will attach a crown, or false tooth, to the abutment. The best way to know if dental implants are right for you is to make an appointment to speak with our Fort Collins dentists and have a thorough examination done. While all of the above are designed to replace missing teeth, veneers are simply meant to improve the appearance of existing teeth and are almost always cosmetic in nature, but can be restorative in some cases. They can be a solution to minor issues like stains, cracks, and gaps, but cannot fix major problems. Veneers are a thin coat of white porcelain or composite resin that cover the surface of existing teeth. While veneers can give you that perfectly white smile you have always dreamed of, they are not for people who simply want a whiter smile or want to fix one little imperfection. Veneers can help people who have worn enamel and wear and tear, and can also protect against further damage. If you are unhappy with your smile, be sure to discuss if veneers are a good option for you when you visit your Fort Collins dentist! Whether you are having trouble speaking and eating in your daily life or just want that beautiful white smile you’ve always dreamed of, our team of dentists can make it happen. We want our patients to feel good about their smiles, and with so many options for restoring and cosmetically altering a smile, there’s likely a good solution for your situation. But, because every situation is different, the best way to determine your options is to schedule an appointment at Shores Family Dentistry. We look forward to welcoming you in!